If you are looking for used Infiniti FX35 accessories or parts, look no further than UNeedAPart.com - the fast and free locator service dedicated to connecting you with the parts dealer that has exactly what you need, exactly when you need it. Our system is simple and is one of the most effective and efficient methods of tracking down used Infiniti FX35 accessories and parts. With a database of over 7,000 parts dealers across the nation, UNeedAPart.com can connect you with only the dealers that have the Infiniti FX35 parts you are searching for in stock, on the shelf and ready for immediate shipment. Our unique system provides customers with the largest selection of used Infiniti FX35 accessories and parts that no other parts locator service can match, making us one of the most popular places on the Internet to find exactly what you need. Find Used Infiniti FX35 Replacement Wheels.Fast! Countless times, the search for used replacement Infiniti FX35 wheels leaves people in doubt wondering where they can find not only the wheels that will look great on their vehicle, but also the ones that will fit. With so many aspects to consider, including bolt patterns, wheel size, depth and offset, it can soon become a research assignment just locating the right type of wheel for your vehicle. Fortunately, with the help of the professional parts locator service such as UNeedAPart.com, you can leave the calculating to us. We will search our database of over 7,000 parts dealers to track down the replacement wheels and any other Infiniti FX35 accessories you need quickly and efficiently. So, give yourself a break and leave the searching to us! 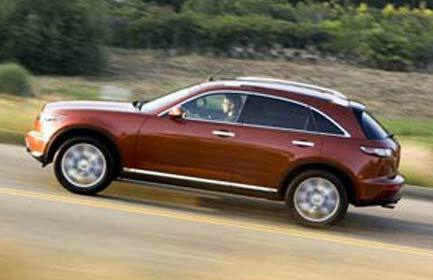 Finding the right Infiniti FX35 accessories and parts is easy! To get started, simply use the Parts Request boxes at the top and/or side of the page. We will instantly match you with the auto parts dealers that meet your search criteria. UNeedAPart.com helps you find the used auto body parts you need in no time!